Coordinator: De Silva Sena S.
Tropical Mariculture takes an in-depth look at developmental activities in a growing industry striving towards sustainability and environmental integrity. All of the contributors to this book have considerable experience and expertise in the field of tropical mariculture, and this is the first book to bring expert contributions together. The topics covered are wide and varied, ranging from general issues such as the impact of mariculture on coastal ecosystems to genetic improvement of cultured marine species, as well as the specifics of breeding selected marine species of current importance, such as groupers and sea bass. Significant coverage is also given to the problems of larval rearing in inland aquaculture as well as the demands of water- and land-based resources in a tropical environment. 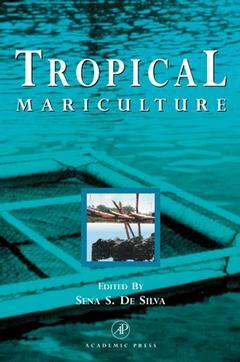 This book will be essential for everyone working in and researching tropical mariculture. S.S. De Silva, Tropical Mariculture: Current Status and Prospects. M.J. Phillips, Tropical Mariculture and Coastal Environmental Integrity. J.H. Primavera, Shrimp Culture in the Tropics and Its Long Term Sustainability. H. Kohno, Early Life History Features Influencing Larval Survival of Cultivated Tropical Finfish. P.C. Southgate and G.J. Partridge, Developments of Artificial Diets for Marine Finfish Larvae: Problems and Prospects. A. Tacon and U.C. Barg, Major Challenges to Feed Development for Marine and Diadromous Finfish and Crustaceans. A. Colorni, Pathobiology of Marine Organisms Cultured in the Tropics. W. Knibb, G. Gorshkova, and S. Gorshkova, Genetic Improvement of Cultured Marine Finfish: Case Studies. T. Yanagisawa, The Biology and Culture of Sea Cucumber. M. Joseph, Mussel and Oyster Culture. C.S. Lee, Culture of Marine Finfish Species of the Pacific. T. Bagarinao, Historical and Current Trends in Milkfish Farming in the Philippines. M.A. Rimmer and D.J. Russel, Aspects of the Biology and Culture of Lates calcarifer. Researchers in aquaculture, marine biology and ecology; fisheries biologists; fish farm managers; environmental managers and planners. Sena S. De Silva is a chairmember in the Aquaculture Department at Deakin University, Australia. He has over 25 years of experience in aquaculture and fisheries management. De Silva has had numerous articles published relating to aquaculture, in addition to co-authoring a text and editing many others. He is a founding member of the Asian Fisheries Society, serving on its council for nine years and is currently Editor-in-Chief of its journal.